It’s time for another Craft Lightning craft project! This month’s topic: burlap. It’s a material that will always be on trend. Today I’m using burlap to do a bit of beachy decorating to make a quick burlap beach decor frame project. It’s going to take about 5 minutes to do. If you have a store-bought template, that’s awesome! It’ll take even less time to make. I used an SVG file on my Cricut machine to cut the stencil template out of my new favorite stencil making material–a cereal box. Also, you don’t need a brand new frame for this. Find an old one, or hit up a thrift store (upcycling is cool!) Paint the frame white if you need to. I’m all about keeping the budget low while I craft, too. So you can see in approximately seventy seconds the entirety of putting together this project, I put together a little burlap beach decor video for you just to show how easy (and fast) this is to do. Now, for those of you who need photos, I’ve got you covered as well! To make the project go faster, prepare your stencil ahead of time. You can use your Cricut machine and cereal box with this SVG to make a stencil. When you get the SVG into Cricut’s Design Space, just adjust the image to fit the size of the frame you’ve chosen, then cut. You can absolutely cut cereal boxes with either the Cricut Explore Air or the Cricut Maker. No knife blade needed. First thing, take apart your frame and take the back out of it. Use this piece to trace the shape onto your burlap. Cut out your rectangle–this should fit perfectly into your frame when we are done. Use a big of blue painter’s tape to secure your stencil to your burlap once you’ve centered the image. This will help tons in getting a nice finished image. Dab with a bit of white paint. I’d watch the video for the technique here–you want to hold your paint brush up and down and dab the fabric, not make long brush strokes. That will just make a mess, and you’ll get bleeds out the edges of your stencil. The seahorse stencil was my favorite! After the paint dries, pop the burlap back into the frame without the glass. And you’re ready to hang! 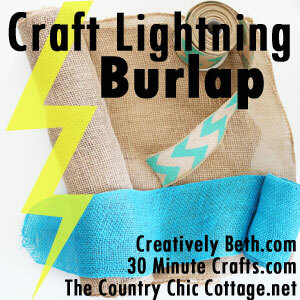 Want to see MORE burlap Craft Lightning projects?? Be sure to click below!! So cute and easy! My kind of craft! Fun and beachy decor Paula, thanks for joining in the burlap fun! Totally adorable and so smart! Pinning!